While the big boys are still kicking the Android Ice Cream Sandwich tires, and issuing one explanation after another why it takes 4-6 months to update all their phones to Google's latest and greatest, others are taking Nike's "Just do it" approach. It seems that the first handset apart from the poster child Samsung Galaxy Nexus that will be officially running ICS, is Huawei Honor, also known in the US as the upcoming Huawei Glory for Cricket Wireless. We know, you haven't heard much about this handset, but its official ICS update is out on Huawei's support page, and, although the default system language is marked as Chinese, the company clarified the usual Android language pack is in as well. The ICS source code was released mid-November, so it took Huawei less than a month to cook up the update, showing once again that what ties the hands of manufacturers up with Android updates are the UI overlays and carrier tests, rather than the mobile OS version itself. There are also instructions how to revert back to Gingerbread if something goes wrong, and the 149MB update size is quite reasonable. If you happen to own the Huawei Honor 4-incher, you can head over to the source link and update your phone, then gloat. Cool, but I never heard of this phone. Like is it GSM or CDMA? Check out the hands-on on gsmarena. I was highly impressed with the smoothness of it's gingerbread single core execution. Heck it's probably the smoothest customized-IU single core droid i ever saw. Those chinese really know their bussines. And they are just warming up. 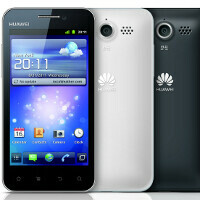 Huawei will be one of the major players in the smartphone market very soon. How can I get update link of Huawei Honor to ICS? I have visited its official website but i found none. Huawei does not care about its sevices responses to its customers. I have emailed about my Honor WLAN problems after upgrading to its ICS demo build several times, no reply so far.